If you've taken the first step in being a networked communicator, you've already rethought your online profiles. They're ubiquitous on social networks. But what are they doing for you? Shaping your search results, that's what. The most basic and important utility of your online profiles is to help you remake what people see when they enter your name in a search engine...as well as when they find you on a site. Take a look at my Google search results, left. You'll see my bios from my two blogs and my Twitter feed right at the top--no surprise, since those sites are where I publish almost daily. Frequency of posts help to move things higher in search results, which is why blogs are such a great search-engine optimization tool. My LinkedIn, Blogger and Facebook profiles follow. Then follow two much more recent entries: a profile from one of my professional groups, which asked me to submit a bio for a panel I helped organize for a conference this fall, and my About.me profile, which includes a personalized URL that includes my full name, also a help with search engines. (I've only had the About.me profile since late October of this year; the site opened its beta to the public and was bought by AOL this week.) Those two entries are followed by two more profiles in frequent use in my work: My Google profile, and my New York Times "Times People" profile. I'm in charge of my search results. 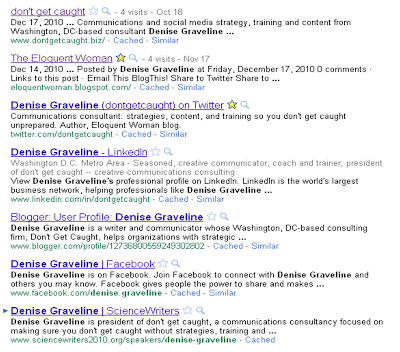 You're not finding lots of other Denise Gravelines (yes, there are some) or random mentions. When you Google my name, you get the profiles I want you to see. The profiles you see aren't all the same. Each one takes advantage of the formats available, and leads you to the places I want you to explore to find out more about me and my work. 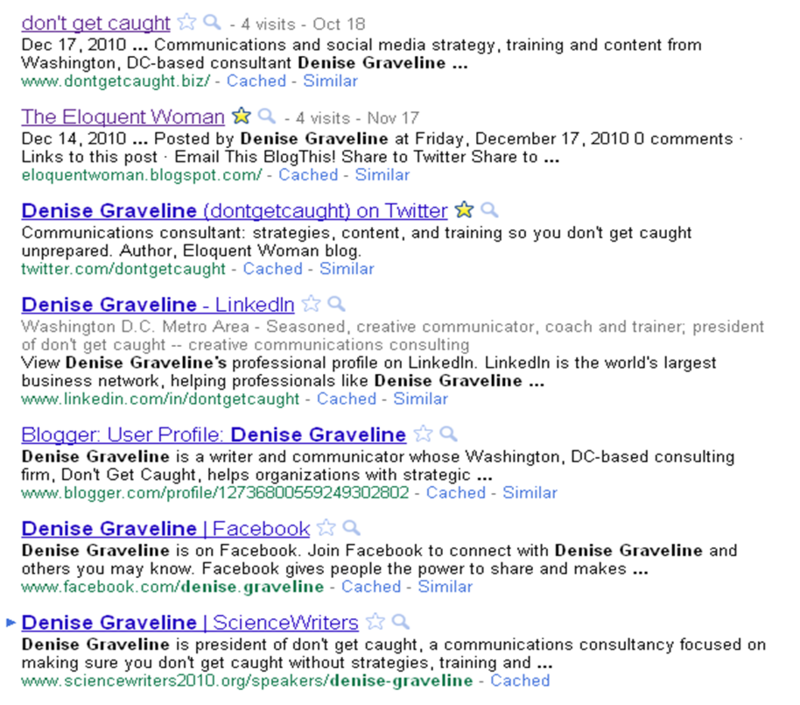 The most diverse profile is my Google profile, because it offers the most flexibility to add links. And even the shortest profile, on Twitter, has a profile-within-the-profile, because it links to the "about" page on this blog...a great way to pack a lot in a small space. Profiles with customizable URLs can move up in your search results, fast. I often use my company name, don't get caught, as my handle (say, on Twitter) and in some cases, I use my name. My About.me profile includes my name in the URL, and is high up in these search results despite being the newest of my profiles. So don't pass those vanity URLs by, when you have the choice: you can get them on Facebook, About.me, LinkedIn and other sites. You can learn about much more than my bio. From my blogs, you can see what I'm working on, who my clients are, and how I write and think as a consultant--and for potential clients, that's gold. From Twitter and TimesPeople, you can see what I'm reading and sharing for others to read, on a wide range of topics...and because I do not relentlessly tweet about my business, you get to know more about me as a person, so we can feel as if we know each other a little when we do meet. Some profiles have started adding the option to include videos, slideshows and more to make it possible for you to expand how you and your work samples are seen. You can see where I've been speaking. As someone who's a frequent speaker, and a trainer of speakers, this is important marketing for me. Having recent presentations or panels (even those for which I'm the organizer rather than the speaker) show up helps advance that aspect of my work. What do your search results look like? Do they reflect what you want people to see? What will you need to do to improve them? I'd love to hear your results, tips and experiences in the comments.